“So what you’re telling me is, that all of these perceived barriers are just that, my perception, not reality?” I leaned forward in my chair partly in shock but mostly feeling incredulous. It was as if the therapists words threw me back into my chair for emphasis. Eighty percent. That is HUGE. Had I perceived the ability to leave my abusive relationship differently, as more of an option, I would have left much sooner. I began to wonder; How distorted is my perception? How many obstacles could I have over come if I had just looked at a problem differently? How many poor choices did I make because I allowed someone else to effect my psychological lenses? I would like to publicly thank Dove for having the courage and the heart to run the campaign they are running. They have been at this particular angle for a number of years now and it hasn’t gone unnoticed. I for one, remember being thrilled to see ads with ladies revealing average bodies in a beautiful light. I have no desire to look emaciated or on the brink of being anorexic. I gave a mental standing ovation for seeing my body celebrated in a fashion magazine. For soap no less. Funny, coming clean with yourself. Why do so many of us perceive ourselves as less than? Is it because of comments our parents made? Perhaps our friends wrote our script? Do we pay lip service to knowing Hollywood is just an image and not reality, only to secretly hold it’s illusion as fact? Maybe we misunderstood the exact message of our religious leaders when they spoke of the evils of pride and bragging. 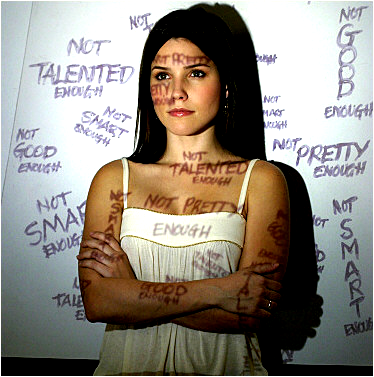 Did we take the time to learn the difference between overbearing ego and healthy self-esteem? For those of us who may have a “less than” attitude about ourselves, was there a time when we saw ourselves in a more positive light? Was there a time that we started practicing humility in an effort to be accepted? Did we fear rejection or ridicule if we took pride in our accomplishments or voiced having self-love? Was that more important than a healthy self-esteem? I am so impressed with the conclusion of this ad. Even when strangers were being kind in their description of their model, they were still closer to the truth than the model. That is a sad reality. It is a shame it isn’t more balanced. We would have a stronger, healthier society if it were more balanced.